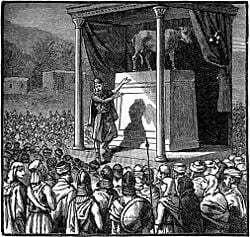 Jeroboam unveils the "golden calf" at Bethel. Jeroboam ("increase of the people"), the son of Nebat, (1 Kings 11:26-39), was the first king of the break-away ten tribes or Kingdom of Israel, over whom he reigned for 22 years. As such, he was the founder of the northern Kingdom of Israel, which lasted until the Assyrian invasions and the exile of the Israelites in 722 B.C.E. Biblical archaeologist William F. Albright has dated Jeroboam's reign to 922 B.C.E.-901 B.C.E., while Edwin R. Thiele offers the dates 931 B.C.E.-910 B.C.E. Appointed by King Solomon as the leader of forced labor gangs in Jerusalem, Jeroboam was identified as the future king of Israel by the prophet Ahijah after Solomon had fallen out of favor with the prophets for establishing high places where his foreign wives could worship. Solomon then saw him as a threat, and Jeroboam fled to the protection of the Egyptian king until Solomon's death. Returning at the time of the coronation of Solomon's son Rehoboam, Jeroboam was nominated king by the northern tribes and succeeded in establishing an independent nation that lasted 200 years despite hostile actions by its neighbors on several sides. He became infamous in the Bible for creating national shrines at Bethel and Dan that competed with the Kingdom of Judah's Temple of Jerusalem. The writers of the Books of Kings considered these shrines a central issue in their view of the northern kings, often basing their assessment of these rulers on whether or not they continued to commit the "sin of Jeroboam son of Nebat" by supporting these allegedly idolatrous public sanctuaries. That Jeroboam remained an honored figure in the northern kingdom is indicated by the fact that a later northern dynasty named one of its sons after him, Jeroboam II, who would become one of Israel's greatest kings. The prophet Ahijah predicts that Jeroboam will become king of Israel. Jeroboam was the son of a widow named Zeruah, whose husband had been a man of some standing in the tribe of Ephraim. While still young, he was promoted by King Solomon to be the chief superintendent of the bands of forced laborers from the tribe of "Joseph," referring normally to both Ephraim and Manasseh, working on projects in Jerusalem. Solomon, however, had incurred the disapproval of the prophet Ahijah by building high places to facilitate religious worship by his foreign wives. Specifically named are the gods Molech of Ammon, and Chemosh of Moab, and the goddess Ashtoreth (Astarte) of Sidon. Ahijah—prophet of Shiloh and thus associated with the shrine that formerly housed the sacred Ark of the Covenant—recognized Jeroboam's potential and dramatically appointed him as the future leader of the Israelite rebellion against Jerusalem's central authority. Ahijah the prophet of Shiloh met him on the way, wearing a new cloak. The two of them were alone out in the country, and Ahijah took hold of the new cloak he was wearing and tore it into twelve pieces. Then he said to Jeroboam, "Take ten pieces for yourself, for this is what the Lord, the God of Israel, says: 'See, I am going to tear the kingdom out of Solomon's hand and give you ten tribes. But for the sake of my servant David and the city of Jerusalem, which I have chosen out of all the tribes of Israel, he will have one tribe' (1 Kings 11:29-32). God pledged to support Jeroboam and promised him a lasting dynasty, saying: "If you do whatever I command you and walk in my ways and do what is right in my eyes by keeping my statutes and commands, as David my servant did, I will be with you. I will build you a dynasty as enduring as the one I built for David and will give Israel to you" (I Kings 11:38). Although Jeroboam's actions immediately thereafter are not described, he soon came to be seen by Solomon as a threat, and the king now sought to kill the potential rebel. Jeroboam fled to Egypt (1 Kings 11:29-40), where he remained for a length of time under the protection of Shashak, usually identified with Shoshenq I of Egypt. What share do we have in David, what part in Jesse's son? The northern tribes rallied to Jeroboam, who was proclaimed King of Israel, while Rehoboam was left with only the tribes of Judah and Simeon, whose territory was within Judah's borders (1 Kings 12:1-20). Jeroboam fortified Shechem as the capital of his kingdom and also rebuilt the town of Peniel, the ancient site of Jacob's famous wrestling match with the angel of Yahweh (Genesis 32:30). He also maintained a residence in Tirzah, which would later become the northern capital. 1 Kings and 2 Chronicles both report that Rehoboam raised a powerful army to suppress Jeroboam's rebellion. However a prophet named Shemaiah proclaimed God's words as: "Do not go up to fight against your brothers, the Israelites." Rehoboam thus abandoned his plans for a full scale invasion. However, there are indications that another possible factor in Rehoboam's change of plans may have been an attack by Jeroboam's former protector, Shishak of Egypt. According to the biblical record, in the fifth year of Rehoboam's reign, Shishak and his African allies invaded Judah in a campaign so effective that even Jerusalem, the fortress capital, was taken (2 Chronicles 11:5-12). 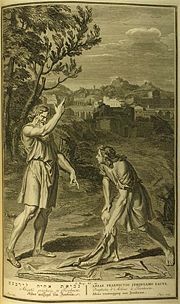 In an effort to provide an alternative place of pilgrimage for Israelites who formerly offered their tithes and sacrifices in Jerusalem, Jeroboam made the fateful decision to establish national shrines at Bethel and Dan, an act which lost him the support of his earlier promoter Ahijah and earned him the lasting enmity of the religious establishment at Jerusalem. Jeroboam erected a golden (or bronze) bull-calf icon at each of these locations. His reported statement, "Here is elohim, O Israel," nearly certainly was meant as a invocation to the Hebrew God, and not to a plurality of deities. Although the Temple of Jerusalem itself had bronze bulls in its courtyard and golden cherubim both inside and out, these "golden calves" became infamous in southern literature denigrating Jeroboam as an idolater. According to the Book of Kings, while Jeroboam was engaged in offering incense at Bethel, a prophet from Judah appeared before him with a warning message denouncing the unauthorized altar. Attempting to arrest the prophet for his bold words of defiance, Jeroboam's hand was "dried up," and the altar before which he stood was rent asunder. At his urgent entreaty, his "hand was restored him again" (1 King' 13:1-6). The prophet himself was reportedly devoured by a lion while returning home, a troubling fact explained on the basis of his forgetting a divine admonition not to accept hospitality from anyone in the north, not even one of his fellow prophets. I raised you up from among the people and made you a leader over my people Israel. I tore the kingdom away from the house of David and gave it to you, but... you have provoked me to anger and thrust me behind your back. 'Because of this, I am going to bring disaster on the house of Jeroboam. I will cut off from Jeroboam every last male in Israel—slave or free. Ahijah added that as soon as Jeroboam's wife returned home, her son would die, which he did. Jeroboam, however, outlived his nemesis, Rehoboam. The biblical record is ambiguous as to whether he survived Rehoboam's son Abijah. 2 Chronicles 13 details a major battle between Jeroboam's army and Abijah's. It reports that "God routed Jeroboam and all Israel before Abijah and Judah," inflicting half a million causalities. It goes on to state that Abijah "took from him the towns of Bethel, Jeshanah and Ephron, with their surrounding villages. Jeroboam did not regain power during the time of Abijah. And the Lord struck him down and he died." Jeroboam did not change his evil ways, but once more appointed priests for the high places from all sorts of people. Anyone who wanted to become a priest he consecrated for the high places. This was the sin of the house of Jeroboam that led to its downfall and to its destruction from the face of the earth (1 Kings 13:33-34). Jeroboam was succeeded by his surviving son, Nadab, who was killed in a coup by the usurper Baasha of the tribe of Issachar, possibly because of the military reverses mentioned above. Like several of the other kings of Israel would later do to their predecessors' descendants, Baasha killed Jeroboam's whole family after taking power, thus fulfilling the reported prophecy of Ahijah years earlier. Although Jeroboam's lineage was thus wiped out, he remained a respected figure in the northern kingdom, so much so that two centuries later another Israelite king was named for him, Jeroboam II. The second Jeroboam is recognized as one of Israel's most effective kings, although his reign was characterized by affluence and corruption that was denounced by the prophets. Historically, Jeroboam I was thus the successful founder of the northern Kingdom of Israel, a nation which lasted for two centuries in a hostile environment until it was finally destroyed by the mighty Assyrian Empire in 722 B.C.E. Jeroboam's history, however, was written by the scribes of his enemies in Judah. These denunciations were preserved to his detriment in the Bible, while any other records of him were lost. The Israelites persisted in all the sins of Jeroboam and did not turn away from them until the Lord removed them from his presence, as he had warned through all his servants the prophets. Thus he became distinguished as the man "who made Israel to sin." His policy of supporting the national shrines at Bethel and Dan was followed by every Israelite king after him, even the Yawhist zealot Jehu, who wiped out Baal worship in the northern kingdom. Because of this "sin of Jeroboam son of Nebat," Jeroboam's name came to be mentioned more than any other northern king in the Bible, rivaled only by the wicked King Ahab. Jeroboam was for the rabbinical writers a typical evil-doer. 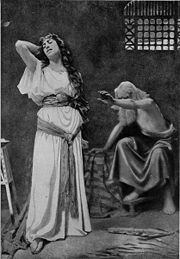 For example in one edition of the Greek Septuagint version of the Hebrew Bible (2d recension), his mother is represented not simply as a widow but as a promiscuous woman. His name is explained as "one that caused strife between the people and their Heavenly Father" (Sanh. 108b). His father's name, Nebat, is construed as implying a defect in Jeroboam's lineage. One opinion goes so far as to exclude Jeroboam from the world to come (Yalk. Kings, 196). His arrogance brought about his doom (Sanh. 101b). His political reasons for introducing idolatry are condemned (Sanh.90). As one that led many into sin, the sins of many cling to him (Abot v. 18). He is said to have invented 103 interpretations of the law in reference to the priests to justify his course of excluding the Levites and worshiping outside of Jerusalem. God had earlier offered to raise him into 'Eden'; but when Jeroboam heard that David would enjoy the highest honors there, he refused. The account of Jeroboam's reign as contained in the Book of Kings reflects the religiously and politically pro-Jerusalem views of later times. However, the account is not entirely biased in favor of the Kingdom of Judah. The stress laid on the popular election of the king and his initial prophetic support may indicate a northern source which in the course of time was updated by the Judean scribes who preserved it. The sanctuaries at Bethel and Dan, where the "golden calves" were enshrined, were old and recognized places of worship and pilgrimage. The king, by making these royal sanctuaries, gave these old places new significance. Critical scholars point out that the Jerusalem Temple itself held far more "graven images" than Bethel and Dan did, including bronze bulls and golden cherubim. The prophetic party, which at first saw Jeroboam as a candidate to correct Solomon's support of high places devoted to foreign gods, found Jeroboam not so pliant a tool as expected. They organized against him and began looking again to the south. Jeroboam's denunciation in both Kings and Chronicles is a manifestation of their pro-Jerusalem bias, and the accusation of his supposed idolatry is specious. History, it is said, is written by the victors, and in this case Jerusalem won the day. Although we a fortunate to have received the story of Jeroboam's calling by the prophet Ahijah as well as Israel's rally to him after Rehoboam's cruel treatment of them, any accounts of Jeroboam or descriptions of his sanctuaries written by the priests of Bethel and Dan are lost. The recent uncovering of a sizable ancient shrine at Tel Dan may yet yield insights into the practice at this sanctuary. The shrine at Bethel, reportedly obliterated by King Josiah (2 Kings 23), remains undiscovered. By any objective historical standard, Jeroboam was a highly successful and popular political leader who established a long-lived independent nation and provided it with spiritual underpinnings which, being destroyed more than a century after the Assyrian conquest in the reforms of King Josiah, outlasted both his own dynasty and the Kingdom of Israel itself. ↑ Occasionally, like Ephraim itself, "Joseph" is used to refer to the area and people of the northern kingdom generally. ↑ Solomon's father David had learned from hard experience that the northern tribes held the potential for serious trouble, as he faced a long civil war against King Saul's son Ish-bosheth at the beginning of his reign, a northern-supported later rebellion by David's own son Absalom that nearly dethroned him, and a third rebellion by the northern leader Sheba as well. ↑ Although the Bible indicates that Ahijah objected to Jeroboam's erecting "golden calves" at Bethel and Dan, the fact that the king overlooked Ahijah's home shrine at Shiloh in favor of the more southerly Bethel may also have been a factor. ↑ Emil J. Hirsch, Jewish Encyclopedia Jeroboam, www.jewishencyclopedia.com. Retrieved November 30, 2018. Albright: 922 B.C.E. – 901 B.C.E. Thiele: 931 B.C.E. – 910 B.C.E.